October 5 - Blessed Francis Xavier Seelos, Priest - Optional Memorial - My Catholic Life! Ship after ship, riding low in the water with the weight of thousands of European immigrants, docked in the harbors of the great coastal cities of the United States in the nineteenth century. Transatlantic ship passage was by then routine and relatively safe. These immigrants came to America’s open prairies and virgin forests to carve out farms, to charter towns, and to establish schools where none had ever been before. These daring men and women came to build a life, and that life included their faith. So priests and nuns came with them in the hold, to plant an ancient religion into new soil. Today’s Blessed was one of those immigrants. Francis Seelos was born into a large family in Bavaria, a land of medieval castles, crusaders, and timeless tradition. He left that rich culture for a new life on the American frontier. He exhausted himself riding horseback, walking, taking ferries, and boarding trains, up and down and across the wide rivers and narrow dirt roads of the young United States, serving new citizens but old Catholics. Blessed Francis felt the call to the Priesthood from a young age. He had the support of his family and local clergy and duly studied philosophy and theology from some distinguished professors in his native land. One of his Benedictine teachers later brought the Benedictine Order to America. By accidents of history, the Redemptorist Order, though founded in Italy by an Italian, had become more prominent in Germany. Francis met Redemptorist priests during his education and became intrigued with their work among the immigrants who had emptied out swathes of Germany to go to America. So Francis joined the Redemptorists with the specific intention of serving the many priest-less German Catholics across the ocean. It was not easy for Francis to leave his close-knit family. Only his father knew his secret plan and that Francis’ departure for the seminary would be his last visit home. Francis embraced his mother and siblings. He came to his father, who could only tearfully gesture with a finger toward the sky. Son and father knew. They would meet again in heaven. Francis never saw his family again. Francis arrived in New York in 1843 and was ordained a priest in 1844 in Baltimore, Maryland. He was first assigned to a parish in Pittsburg, and then as a priest co-worker alongside Saint John Neumann, a fellow Redemptorist. They carried out ordinary parish duties and gave parish missions. Father Francis quickly gained a reputation as holy, always available, amiable, and wise. Like Neumann, he became well known as a sage confessor who exercised this ministry of mercy in multiple languages. Father Francis’ apostolic zeal, prudence, kindness, and doctrinal integrity thrust him into positions of leadership in his order. He was so skilled a priest, and so admired for his virtue, that he was proposed to be the bishop of Pittsburgh. Francis only narrowly avoided this exalted burden by personally writing to Pope Pius IX arguing for his own inadequacy. After years of priestly service in America’s eastern portion, Francis became an itinerant German and English preacher in the nation’s middle, crisscrossing Illinois, Michigan, Wisconsin, and Missouri. In 1866 Father Francis was assigned to New Orleans, where he continued his tireless, uncomplaining priestly service, and where his prayers were considered unusually efficacious. But in New Orleans his service came to an end. He contracted yellow fever while visiting some of its victims. He died at 48 years old, but not before at least one miracle of healing was attributed to his intercession while he lay dying. His cause was opened in 1900, and Francis Seelos was beatified in 2000 by Pope Saint John Paul II. This priest par excellence stands shoulder to shoulder with Saints Marianne Cope, Damian de Veuster, John Neumann, Mother Frances Xavier Cabrini, and thousands of non-saint clergy and nuns, all nineteenth century European immigrants to America. They each left things comfortable and known for their opposites, they each sacrificed and preserved the faith and gave a new church new heroes. 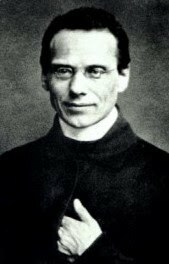 Blessed Francis Xavier Seelos, your zeal, intelligence, and innate goodness was plain for all to see. You were an ideal priest loved by all you encountered. Through your intercession, help all missionaries to persevere in their difficult vocations in unfamiliar lands.